It’s ironic that the world’s best-known karate master never existed. The much-loved Mr. Miyagi from the Karate Kid movies is the product of a Hollywood scriptwriter, and just one more example of how the public’s view of martial arts has more to do with fantasy than reality. This isn’t always a bad thing. Movies can inspire people to try the martial arts and from the many, a few will stay on to discover what martial arts truly has to offer. That’s why, for the serious martial artist, a teacher who really existed is so much more inspiring than any fictional character can ever be. The reason for this is found in the Japanese word for teacher: Sensei – which means ‘one who has gone before.’ From the point of view of a student, it is always good to know that whatever hardships you may be enduring at the moment, your teachers has endured the same in the past. So serious martial artists may be interested to know that the fictional Mr. Miyagi was inspired by the real-life karate master Chojun Miyagi, and unlike his Hollywood namesake, Chojun Miyagi lived and died in Okinawa. Okinawa has a rich and proud history of karate, however Miyagi’s name is one of a small handful of masters who can be said to have had a truly global influence. Most of what is known about Miyagi has been pieced together from accounts written by his former students. Miyagi’s own extensive writings were destroyed in the fires of World War II. The students’ records paint a very appealing portrait of the man: meticulous and fastidious about details, studious, open-minded, obsessive about karate, demanding of his students yet warm-hearted and taking a keen personal interest in their health and development. Admittedly, Miyagi is relating Sanchin to martial arts, saying that it gives the practitioner a deep and fundamental power (achieved by Sanchin’s sense of ‘rooting’ to create a strong connection to the ground). However this connection is more than simply physical, it is mental and spiritual too. The deep breathing of Sanchin is the same as practised in yoga, chi-gung and Zen meditation. The straight posture and stacking of the spine are a standing form of seated meditation. The assertion that karate and Zen are the same was part of Miyagi’s drive to gaining wider acceptance for his art. 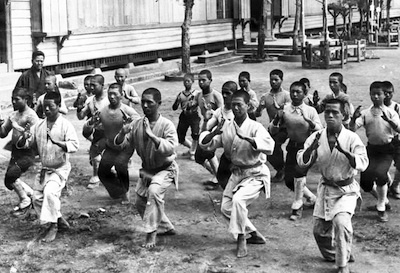 At the time Okinawa karate was considered inferior by the leading martial arts authorities in Tokyo. The arts of Kendo, Kyudo, Iaido and Aikido were closely associated with Zen and the perfection of the mind and the self. Even Judo was, according to its founder Dr Kano, ultimately concerned with perfecting the character of the practitioner. Karate was, by contrast, a fragmented and ungoverned native art with no unified standards. That is not to say it was of low quality, but rather of varied quality, with small dojos and family styles scattered around Okinawa in a haphazard synthesis of local Okinawan ‘Te’ (Hand) and Chinese arts. In Zen, even seemingly everyday acts like tea making and flower arranging are elevated to an art form and governed by kata or ‘ways of doing things.’ The acts vary, but the recurring theme is that they should be performed with the right ‘mind,’ or as we might say today in the West, the correct approach. The implication is that if you can learn to approach one thing correctly, you will approach all things correctly, including life itself. “At the end of this essay, I will give you a phrase which is quoted from the famous book "Bubishi" or "Wubeizhi" written by Mao Yuan-yi in the late Ming era, in which he commented on the martial arts by taking examples of calligraphy and horsemanship. For further reading, two translations of articles by Chojun Miyagi can be found on the blogsite of Sanzinsoo, under the heading ‘Miyagi’s Essay’.